I arrived in Vietnam in August 1967, about five months after the battle of Fire Support Base Gold, at Suoi Tre in Tay Ninh Province. A sense of urgency and tension was still in the air as Captain Bill Allison took over command. Supply seemed limited. I was issued a dented helmet, a rifle that did not function because it had been damaged in a previous ambush, no cleaning rod, and a flak jacket obtained from a pile of used and discarded equipment. As we used to joke, an all-expenses-paid vacation to Southeast Asia. Jim Frost, an eighteen-year-old buck sergeant, was my squad leader. He had already aged and looked older than me at twenty-three. Sergeant Kay, a Korean War veteran, was platoon sergeant. A thing that I noted about Kay, Frost, and a number of others in the company was their faces: they looked as though they had not slept much and had a haunted and glassy stare; I had seen that look in a painting by Howard Pyle of a World War I soldier at the end of a trench, staring into the night. Company C was equipped with tracks, armored personnel carriers with 50-caliber machine guns in their turrets. In the battle, it had been the leading rescue unit that saved its sister battalion. In the jungle, I saw endless ambushes, firefights, land-mine explosions, and night patrols; we dug twilight foxholes that filled with water immediately in the constant rain. As I worked with them, I realized that the men I was serving with had witnessed hell itself: Suoi Tre, March 21, 1967. This painting is a memorial to those I served with and to the American soldiers of the 3d Brigade, 25th Infantry Division, who, some dying, some surviving, took part in that engagement. After the war, veterans sent me their photographs and descriptions. I remembered what had been described to me by members of my company. My purpose was to create a chronicle of the battle. The battle took place in an oval clearing. Transported to Fire Support Base Gold by helicopter the day before were three batteries of 105mm howitzers and the 450 infantrymen of the 3d Brigade, almost all young draftees. The assault lasted four hours. 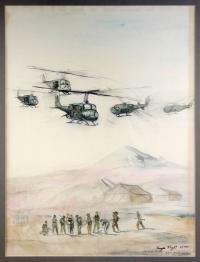 In the painting waves of North Vietnamese soldiers are overrunning the perimeter of the American firebase. There was a lot of hand-to-hand fighting. M-16 rifles jammed; at right a soldier is swinging one of these. Company B is in the foreground. A quad-fifty machine gun is being turned around by the enemy to be fired on the U.S. batteries. Lieutenant Colonel John Vessey's howitzers are being leveled to fire at the oncoming enemy. At least 2,500 seasoned North Vietnamese troops of the 271st NVA Regiment carried out the attack. Some of these are shown in the lower foreground, unleashing an unrelenting bayonet, grenade, and hand-to-hand assault, flooding even into the howitzer emplacement. Toward the end of the battle, American units were down to their very last rounds of ammunition. I tried to capture the fantastically fierce defense by the inexperienced American troops, and have included at least fourteen portraits of actual members of Company B. The last-minute appearance of a come-to-the-rescue column of tracks and tanks is shown at the left. If the battle had been lost, the North Vietnamese and the Viet Cong could have claimed a latter,day battle of Little Big Horn. A Communist victory, so desperately needed, would certainly have further dispirited an already divided and embattled American populace. It might have demanded that its army be withdrawn from South Vietnam, leaving North Vietnam and its Communist allies in control of the South without shedding any more blood. But the opposite took place. I have painted it in an alla prima style. The numerically weak, inexperienced 3d Brigade defeated a much larger, more seasoned force. I try to honor and show what they had not taken into account: the still-surviving spirit, inventiveness, and valor of an American youth that, sometimes foolishly, but always bravely, took up the call to arms. Four hundred and fifty U.S. soldiers beat back twenty-five hundred Viet Cong and North Vietnamese, with thirty-one Americans killed in action and eight hundred enemy killed.